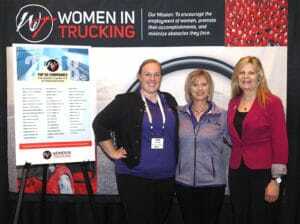 Brenny Transportation staff (from left) Erin Turcotte, customer service; and Bonnie Supan, vice president of operations and finance; with Ellen Voie, president and CEO of Women in Trucking. Brenny Transportation Inc. of St. Joseph was named a “Top 50 Company for Women to Work For in Transportation” by Redefining the Road magazine, the official magazine of the Women In Trucking Association. According to Brian Everett, publisher of Redefining the Road, there are five key features that distinguish companies recognized on this list: corporate cultures that foster gender diversity; competitive compensation and benefits; flexible hours and work requirements; professional development opportunities; and career advancement opportunities. Nearly 150 nominations were received, and more than 7,000 votes were cast to identify the companies named to the list. Brenny Specialized staff (front row) Kelly Klegstad, logistics team lead; Jerry Rau, significant other of Annette Brenny; Annette Brenny, Todd Brenny’s mother (Todd and Joyce Brenny are the owners of Brenny); Bonnie Supan, vice president of operations and finance; (back row) Karl Penner, specialized team lead; Lawrence Schreiner, over-the-road driver; Wyatt Ahrens, logistics team lead; and Todd Plante, over-the-road driver/trainer. 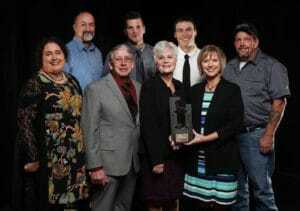 Brenny Specialized Inc. of St. Joseph received the for-profit established company 2018 Innovation Award from the Greater St. Cloud Development Corporation for creating its own Young Driver Training/Apprentice program in response to an industry shortage in drivers. The Innovation Awards recognize St. Cloud area for-profit and nonprofit organizations employing innovation to solve problems and create opportunities. The St. Cloud school district Local Education & Activities Foundation awarded $21,250 during its fall activities granting cycle, $1,500 in fall academic contingency grants, $10,916 in PAKRAT Program grants, $5,330 in fall-activities participation grants, $18,500 in adopt-a-classroom grants, $4,373 in fall Homeless Student Services grants, and $12,000 in support of the district’s Elementary Talent Development Program. Kennedy Community School received $825 for its drama program and $230 from the participation fund. Apollo High School received $1,000 for Nordic ski boots, $1,000 for girls softball uniforms, $950 for Math League, $700 for yearbook camera lenses, $1,000 for Swim Camp transportation and expense and $1,150 from the participation fund. Jamie Deuhs of St. Joseph has been accepted for admission for the 2019-20 academic year at Luther College, Decorah, Iowa. Deuhs has been awarded the President’s Scholarship.